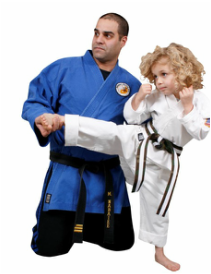 Nabaiee's Family Martial Arts is owned and operated by a dynamic brother and sister team. The Nabaiees were born, raised and educated in Maryland. ​The founder and Master Instructor, Massih Nabaiee, is a Black Belt with 31 years of Martial Arts experience. He received his Black Belt from Grand Master Jhoon Rhee in 1987 and then continued training and teaching at one of the top performing schools in the country. After opening his own school in 2005, he has continued to influence future generations of martial artists. He is certified as a Personal Defense Readiness Coach and continues to expand his knowledge through interdisciplinary training. Mr. Nabaiee has the unique ability to relate to people of all ages. His teaching style combines compassion with discipline. He creates a learning environment that is practical, challenging and fun. Nazanine Nabaiee Magnolia is the Director of Operations. Jhoon Rhee and is a 1st degree Black Belt in Tae Kwon Do. She has earned a Master’s degree in Social Work from University of Maryland, Baltimore with a specialization in Children’s and Family Health as well as Master’s degree in Education from Johns Hopkins. ​Ms. Nazy is also a trained and certified child and infant yoga instructor. Her experience in child development allows Nabaiee’s Family Martial Arts to focus on building healthy attitudes, physically and emotionally. Our staff is comprised of professional adults trained in specialties that compliment the mental, emotional and physical development of our students. Each class is taught by a qualified adult instructor. We pride ourselves on a group of Black Belt instructors with careers in fitness, early childhood/special education and intervention as well as mental health specialized social work.